I currently work with Primary school children in an after-school club and coach different sports sessions at lunchtimes in schools across Edinburgh. Basically, all I do is play games and have fun all day! I love my work! I first came across Rabble in Manchester when I went along to two of Kieran’s sessions and I absolutely loved it! Playing competitive team games with a range of different people where the whole premise was to have fun; I was in my element and had to find out more. Why did you decide to become a Rabble Instructor? 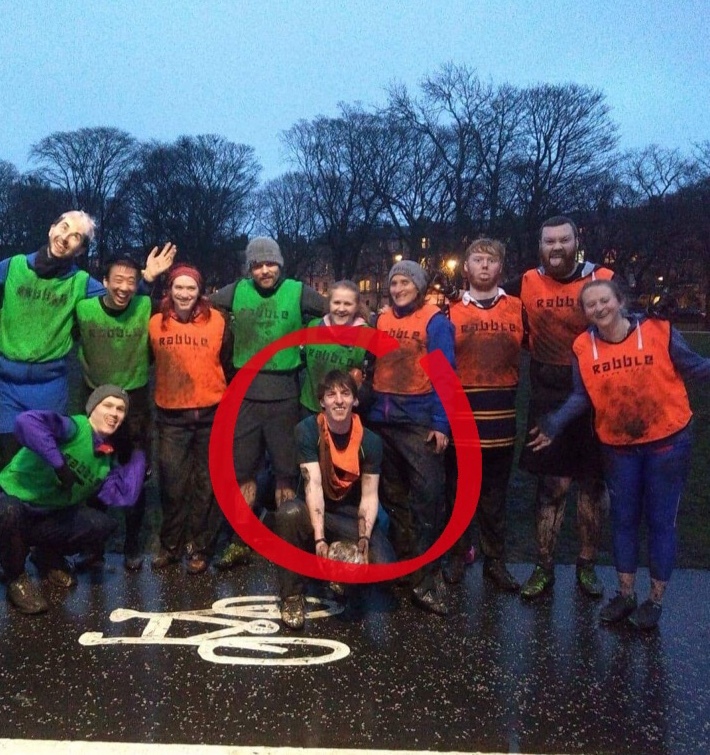 With my background being in sport and having really enjoyed the sessions I’d been to, I plucked up the courage to see if I could start a Rabble in Edinburgh. I thought that Rabble would be something the people here would love as much as me so I wanted to give them the opportunity to enjoy some fun exercise! I also really liked the social side of Rabble and how it appeared to bring a lot of different people together as a community. What does Rabble with Alisdair look like? I like to think we look like a group that absolutely anyone can be included in with no pressure to be the best. 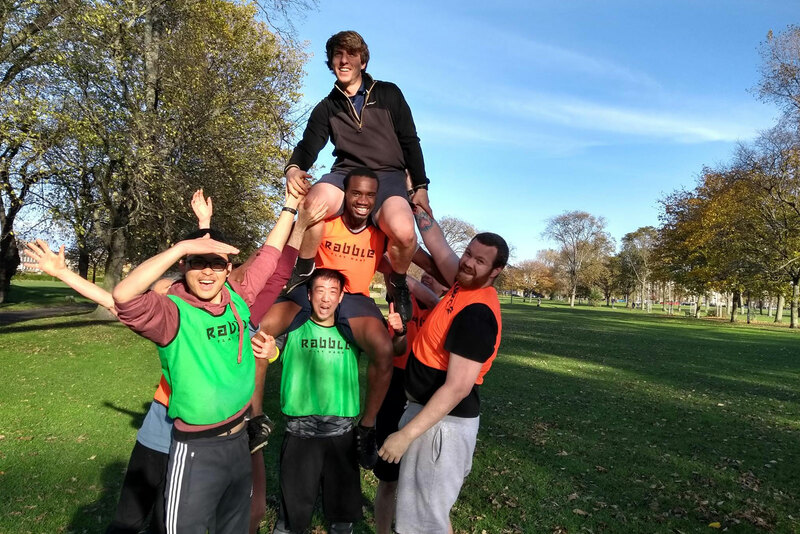 I want people to enjoy Edinburgh Rabble first and foremost so don’t put any grand expectations on players to do a specific amount of exercise. I set up the rules of the games and it’s up to the players to work as hard as they want. I hope that when people walk past our sessions we look like we’re just running about daft and enjoying ourselves! We have a few social media outlets where regular and new players can get information about upcoming sessions and events. How did you train to become an Instructor? Any feedback on the training? In January 2017, I went down to London for a weekend where I did two days training taken by Charlotte. I was nervous before the training, as I didn’t know what to expect and if I would be any good at it. However, pretty much straight away I realised that there was no need to be nervous as Rabble was something I had been doing since I was a kid; playing games! It poured with rain for the two days I was there and all the clothes and notes I had taken were soaked by the end of it, but I didn’t care at all because I had had such a great time learning, playing and instructing the games. The training was very thorough but by the nature of it, it was non stop fun. I knew for sure that I wanted to start Rabble in Edinburgh! Words of wisdom for people starting as, or considering becoming an Instructor? Give it a bash and have fun with it! Don’t be afraid to adapt/change a session or do your own thing with it! As long as your players are PLAYING with smiles on their faces as opposed to grimacing from exercising, you’re doing something right. Favorite moment from a Rabble game? There are simply too many to pick just one! I think one of my favourite things about Rabble sessions are the questions you get asked. I will always say that there are no silly questions but here are some of my favourites that make me wonder about my ability as an instructor: “Where’s the ball?” was asked as play continued on behind the player. “What’s the incentive to TAG” which I think sums Rabble up pretty well. And lastly, my definite favourite: “So if they win, we lose?”. Favorite TV show right now , and why? I’m a bit picky when it comes to telly, nothings really got me hooked at the moment! However, I am watching Better Call Saul because it takes place in New Mexico, my home state! I think I’d just like to thank the players, all of them, who have come along to Edinburgh Rabble and left their mark and made it what it is. Regardless of anything else, the players make the sessions what they are and make me as the instructor enjoy the sessions as well making a great community and great friendships! So Thank you and I promise we’ll never play planking duck duck goose again.